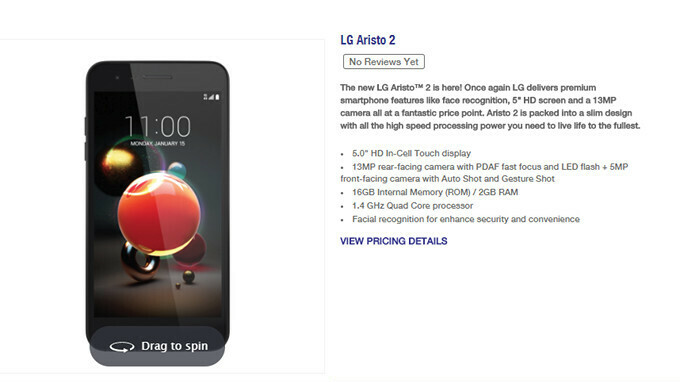 As expected, the LG Aristo 2 has just made its debut at MetroPCS and you can get it for a great price: $60. Although the smartphone usually costs $140, the carrier offers a $30 instant discount and $50 mail-in rebate, so you'll be saving $80. When it comes to specs, everything seems to come in line with our previous report. LG Aristo 2 comes with a 5-inch display with HD (720p) resolution, a 13-megapixel rear-facing camera, and a secondary 5-megapixel camera with Auto Shot and Gesture Shot. On the inside, the budget-friendly smartphone packs a 1.4GHz quad-core processor, 2GB RAM and 16GB expandable storage (up to 32GB). The 2,140 mAh battery is supposed to offer up to 17 hours of talk time, which is pretty decent. Unfortunately, smartphone companies still launch products powered older versions of Android and the LG Aristo 2 is no exception. The smartphone ships with Android 7.0 Nougat on board and it's hard to believe it will be updated to Oreo. That’s crazy only $60. That’s a great buy.